Spring and summer is the time of babies. Apparently, for us, it's also the time to buy 30 more adults. But the babies are the best part. 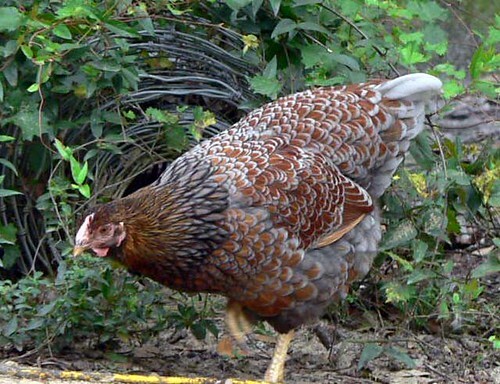 Months ago I ordered some Blue Laced Red Wyandottes - a rare, and beautiful, breed of chickens that took my breath away the first time I saw them. 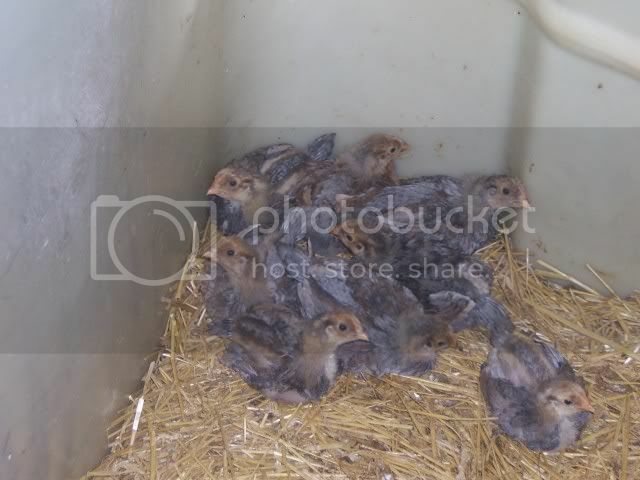 June 1st I received 14 of these chickies. Unfortunately I didn't get any good pictures of them when they were day-old and fluffy. You can already see the beautiful patterns and colors in the wings. We have some really dark ones and some really light ones. A couple of weeks later, here they are, in all their glory. 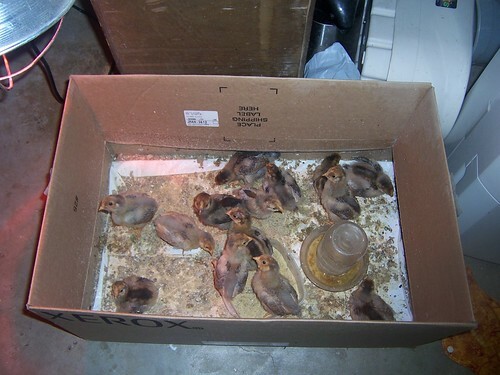 Now they're housed in the barn and their feathers are almost all filled out. I can't wait for them to grow up. 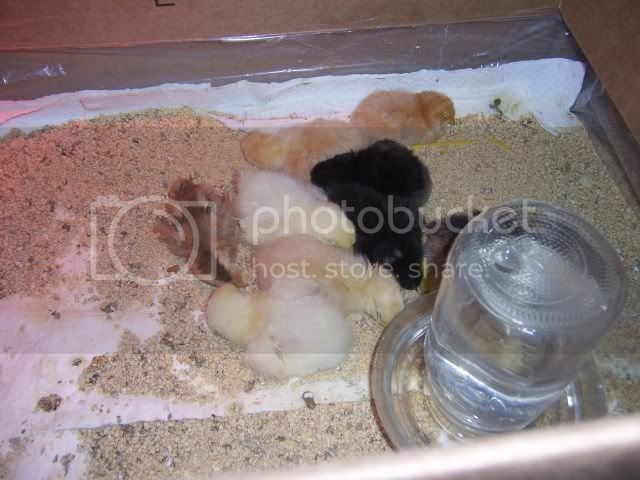 Then, a few weeks ago, we hatched some of our own home-layed eggs in the incubator. We had about 28 eggs in there, and only got about 10 chicks, but I was happy with that! They came out nice and wet and weak. Then a few days later puffed up nicely! 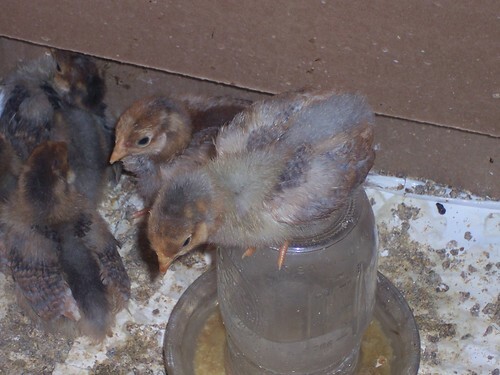 So, that's the chickies so far this year. 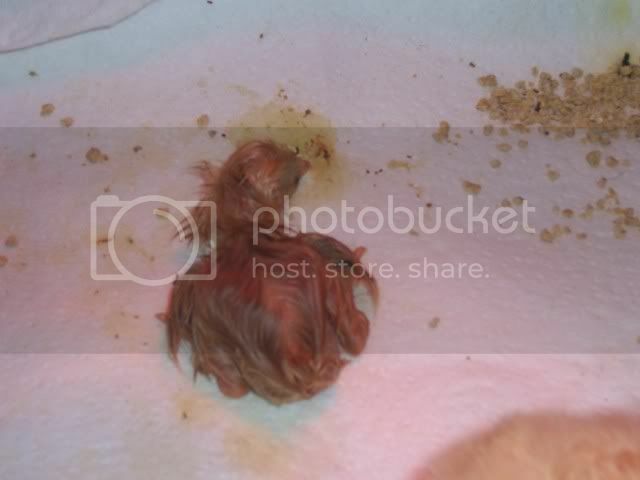 We have another set of eggs in the incubator set to hatch soon. Living out in the middle of nowhere has some amazing benefits. We have land, animals, a safe, crime-free environment for the kids. We have a house that was practically given to us - true, it needs repairs, but what house doesn't? We have a wonderful school, a quiet atmosphere, and the chance to see the stars in all their glory without any lights. I do believe that sometimes the cons outweigh the pros, though. The cons are many and are extremely life-limiting. - In order to go grocery shopping, we have to drive half an hour. There is a small grocery store about 20 minutes away, however, it's prices are sky high and it's produce leaves something to be desired. In summer, there are farmer's markets, but (except for 2 I can think about) those are even 15-20 minutes away. - Our closest Catholic church is 10 minutes away. However I find it extremely boring and do not like the Priest. I also don't like how they aren't involved with the community, as I find that one of the ideas of Catholicism. The next closest church is about 35 minutes away. - There are very few, if any, chances to meet other moms unless your kids are in school. Our library (15 min away) does have a weekly story time, but they're always full. I have yet to find even an online mom's group for our area. I am hoping that our YMCA membership will help - hopefully I can enroll the girls in some classes and make friends. But even Licking County, where the YMCA is, is 25 minutes away. - Doctors, allergists, dentists, hospitals, and other related services. Tamsyn's allergist is 30 min away. My dentist is 25 min away. My therapist is 20 min away. And heck, my psych is almost an hour away. - Because of the distances of, well, everything, we spend a TON on gas money. Ben's gas allowance JUST for work is $100/week. That doesn't include my gas for things like appointments. Lately I have been very lonely and trying to reach out to find friends. I'm part of a columbus mom's board, but 90% of them live in downtown columbus or the surrounding neighborhoods - 45 min to 1 hour away. As you can imagine, it's very frustrating. And disheartening. And I'm not sure how to fix it. This looked like a ton of fun. Credit goes to "The Un Mom". The idea is you take one post where you just blurt out random thoughts that are going through your head. Sounds kinda like therapy to me, but hey, it works. I hate how our phone works. Not the phone itself, but the service. Our area code is 740. I should be able to call all of 740 without dialing 1, right? At least in my mind. But nooooo. Some 740 require a 1, and some don't. So I end up dialing, just to get a 'you need to dial a 1 or 0' message. And if I dial a 1, when it's not needed, i get the OTHER message. Incredibly frustrating. I have this planner, and I love it. It's notebook sized, plenty of room to write in things. I paper clip things like invitations, business cards/appointment cards, etc in it. I'm very organized with it. The problem is I don't look at it every day, and therefor tend to miss things. I need to buy the kids some soy-doh. I need to do weird housework like picking up all the hairbands in the bedroom. We need a vacation. And a babysitter. And a new kitchen floor. I feel like my life is going downhill and uphill at the same time. Medication has changed EVERYTHING. But on the downside, I'm getting fat. I'm drinking more. I'm on the computer all. freaking. day. I can't seem to get up early, even though I set an alarm and have things to do. And I have no idea if it's medication related, or if it's just me. Am I a lazy? Am I unmotivated? Do I just need stimulation? School starts soon. I have some homestudy courses registered. Am I still depressed? Do I need to go on a mild antidepressant in addition to my BPD meds? I suppose this is things I need to talk with the therapist and psych about. I need to take some photography classes. Or at least learn how to use my camera better. Heck, I need a new camera... this one is 5 years old. Does wet steam cleaning the carpet kill dust mites, or promote growth? I need to organize my closets. I seem to have a ton of storage space and absolutely no idea of how to use it. Morrigan has no idea that there are 14 baby chicks in our utility room. I've managed to hide them for almost a week and a half now. 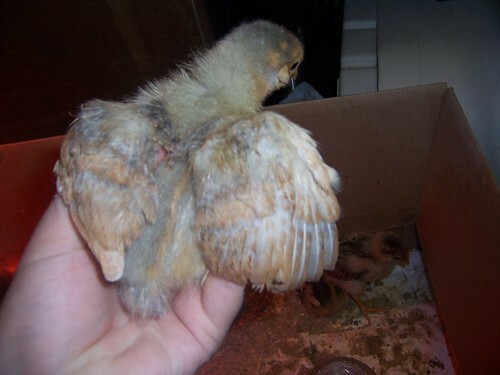 This weekend I'm kicking their little fuzzy butts outside to the pen in the barn because they stink. I'm 23 now. I don't feel different. I almost didn't notice my birthday passed. We were at Rusty's party all day, and the only recognition I seemed to get was a very disappointing night out, where we all went drinking, and then everyone passed out. And then had to get up at 6am the next morning to pick up the kids. I feel kinda cheated, honestly. I wanted my tattoo, or to go on a bike ride with Ben, or to play card games all night. I wanted a cake and ice cream. I wanted to have my own little party with my friends and my family. But we had to go to Ben's parents instead, because Rusty's party was on my birthday, because he wanted to watch a car race on his birthday by himself. Lucky him. He got to do what he wanted. Not that I'm angry or bitter at Ben's parents, because I'm not. It was just kind of a sucky day. On to a new positive note, we figured out another trigger for Tamsyn's eczema. The new allergist we're going to noticed she tested positive for eggs, and had us take them out for 3 weeks. A week into it, things have improved dramatically. She's even had a few slip ups (bite of bread, finger-full of cheesecake) with very little reaction other than some itching and very slight redness. It's a very positive sign! Tamsyn is a mover. She loves dancing. We can put on some music and she'll sway and wiggle and turn in circles. Her cutest move is when she starts marching and bouncing. Sometimes daddy gets involved, and they have a ton of fun together. And then, sometimes, she just has to jig on her own. One of the perks of living out here in the boonies is our visitors. So far we've had a snake and a hawk. Now we've had two visitors in one day! 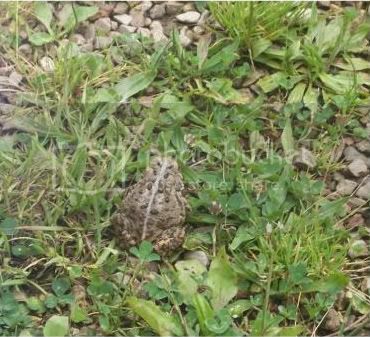 Our first was a bumpy little toad. Ben almost stepped on him. 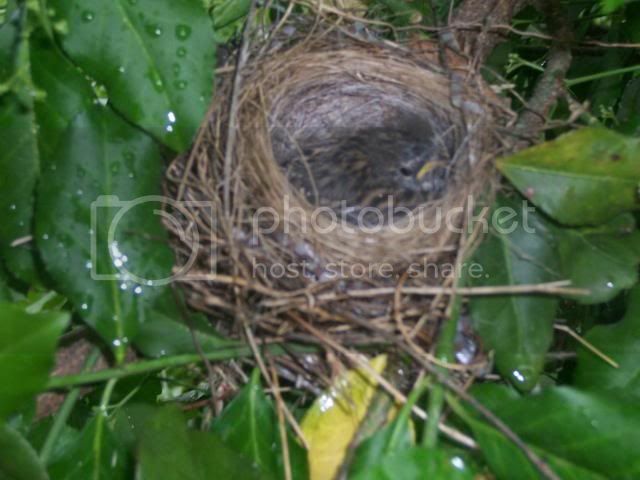 We seem to find a lot of our visitors that way! The girls were fascinated. Ben gave it to Morrigan to hold, and she did, with no hesitation! Then she decided, on her own, to let it go. I was proud. Sometimes she's very possessive. Our second visitor was slightly less active, but beautiful none-the-less. Morrigan has adopted one of our adolescent chickens as her own. 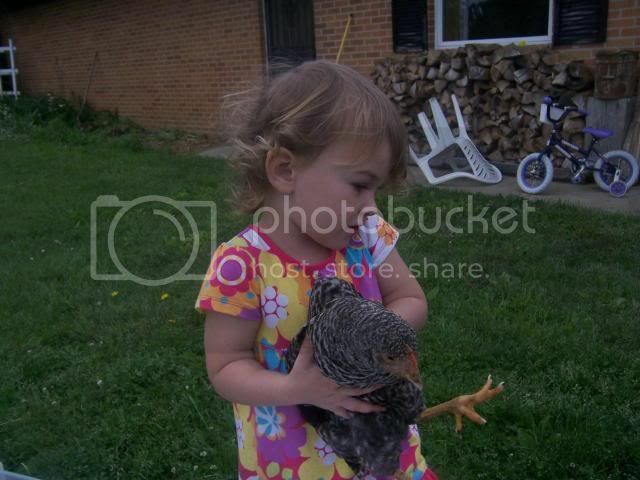 Luckily the chicken in question is extremely tame, one of our hand-raised ones. But she carts it around all day. It's sooo cute. We were a little worried about her hurting him. He seemed a little lethargic, but once she put him down he bounced around fine. She named her "Gray". Then Morri got creative. She decided to find Gray a house. So that's Morrigan's new pet. Much better than a puppy, in my opinion. Memorial Day weekend, after a relaxing day with Ben's parents and family (Happy 59th birthday, Rusty!) we were gardening our butts off! All together we put 80 plants in the ground. 36 tomato plants, organized and caged; 36 peppers, including a few different hot and spicy varieties. Our asparagus is exploding in wonderful stalks. 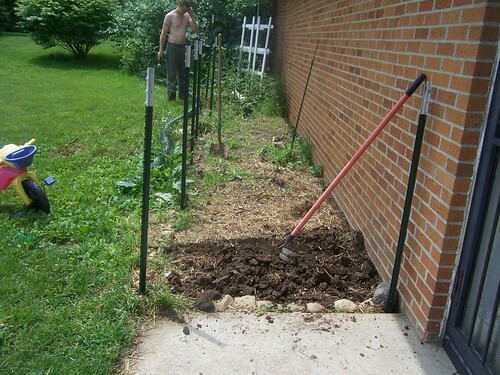 The house bed has been tilled, hoed and weeded. You can see all the weeds in the back here. There were a ton of thistles and weeds! 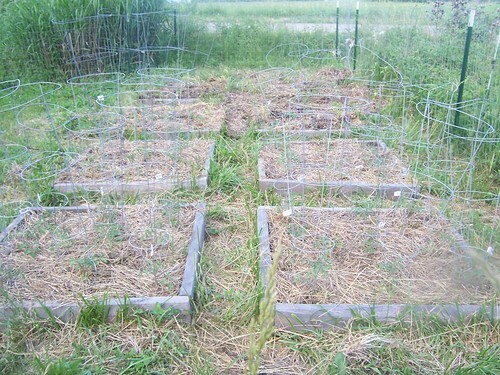 Once, last week, the WHOLE house bed was covered in all these weeds. 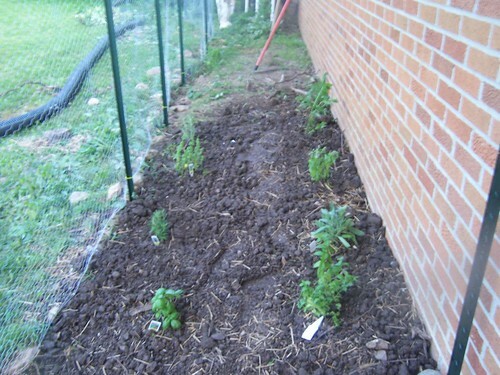 Then it was planted with 8 wonderful herb plants, including rosemary, basil, lavender, spearmint, and peppermint. We surrounded it with chickenwire to make sure the chickens, and other assorted wildlife, would stay out. We have 8 more herb plants waiting to go in the ground, a few various veggie and fruit plants like watermelons, cucumbers, and zucchinis. 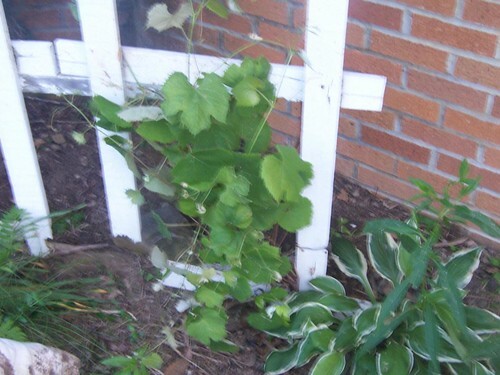 I also found a grape plant hidden behind all the weeds in the house garden, fighting it's way up the trellis. We have another grape vine growing in the front garden, and I believe that I will transplant it on the other side of this trellis. 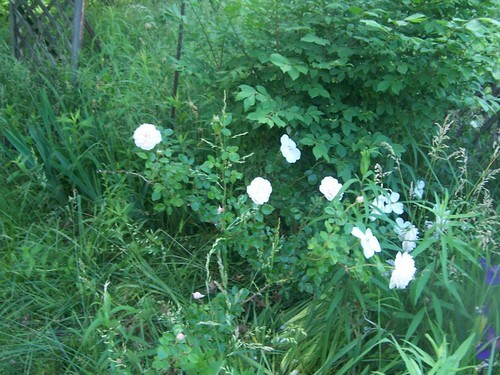 In the hidden, overgrown area of the front garden, we found this absolutely beautiful rose bush. 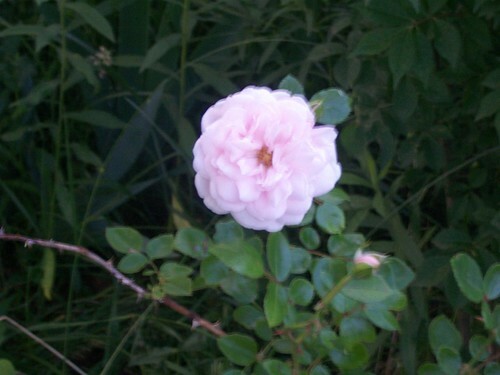 The one flower I am absolutely in love with is roses. The other flowers really don't interest me, but roses are wonderful. Whew! We both got sunburned and dirty. I love it. This year we will have homegrown produce, homegrown herbs, homegrown honey, goat meat, goat milk... Our homestead is really taking off!